The site of the former Hilltop Steakhouse in Saugus is being developed into the Avalon at Hilltop residential community. IT ALL STARTED when we ordered a small couch with a designer name for an upstairs guest room. Rather than remove the door, the delivery men huffed and puffed and squeezed the couch through the narrow opening, tearing the fabric so that the stuffing bulged out. It looked like a giant feral cat had chosen our fancy-brand couch for a scratching post. “Avalon fail!” we wrote the sales manager, asking for a repair. After that minor domestic trauma I started seeing the Avalon name everywhere: on cars, wines, river cruises, skincare products, nightclubs, even the development replacing my beloved Hilltop Steakhouse in Saugus. You know the place: the giant cactus on Route One. 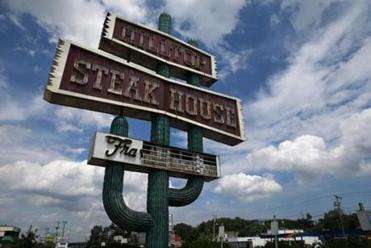 For years it was emblazoned with owner Frank Giuffrida’s name, until the steak house went out of business and some of the marquee letters fell off, so it only read “Fra Giuffrida” — as if he were a medieval monk who saw the face of the Virgin Mary appear on a rib eye. Now the 14-acre property is being redeveloped into one of those “work, live, play” communities, with 280 luxury apartments, two restaurants, a dry cleaner, and a hair salon. Its name? “Avalon at Hilltop.” No more dining rooms named “Carson City” or “Dodge City” in this millennial mecca! The iconic sign will be taken apart, piece by piece, and restored to its former glory. That’s the banality of branding: too many places and things chasing after too few monikers. Companies used to have names that had an actual relationship to their products: General Motors, Burger King, Lumber Liquidators. Now, with companies layering on different lines of business, names have gotten vague and generic, the better to cover whatever new opportunity comes up. Just walk around the new inno-hoods like Kendall Square and note the firm names: Momenta, Alnylam, Akebia, Sarepta: Can anyone tell me what these companies do? And don’t get me started on addresses! Actual street names are so 20th century; now we have Centers and Landings and Squares and Places, all the more prestigious if the address can begin with the number one. There’s One Station Square and One Financial Center and One Dalton, and almost never a Two. Nothing is sequential; it’s like finding your way around Tokyo. My new favorite is One Greenway, the luxury apartment building jammed into the corner of Kneeland and Albany Streets, where a 687 square-foot one bedroom goes for $3,100 a month. The name conjures up a vernal meadow, to help you forget you’re living above a highway on-ramp. These are places and products named by a committee — or worse, by consultants. Compared to such vaguely dystopian designations, “Avalon” starts to look kind of cozy and benign. It’s not original, but at least you can spell it.